I. The state of Colorado. I haven't been to the DMV lately, but here's the basics on how it works in Colorado. The state claims they have no other way to collect revenue, so they must charge extra on top of extra for vehicle registration and license plate title fees. There is no emissions testing here because we live in the west and they don't do that. For my 2013 Toyota RAV4, it costs about $200 to register each year. The state of Colorado tells me that's because they have no other way of collecting money. I find this to be highly suspicious, and furthers my theory that this state literally doesn't know how to function, concerning governing. For context, in Wyoming, it's a flat-rate of $30 +a fee for the county. The plan is to re-register all of our vehicles to Wyoming when it comes to be that time this summer. The cities of Colorado Springs and Manitou Springs think that people, apparently, want to be there more than they actually do. The incline and Barr Trail are popular hiking spots. The city decided that they would start charging people $40 to park to hike because that would help make money for whatever it is they need this money for (they claim trail upkeep). Most people I know in Colorado are teachers and teachers are poor and Colorado teachers are particularly poor because Colorado barely pays a living wage to teachers, when you line it up with the cost of actually living here. In the four states I've taught in, this is the one that is the most unbalanced when it comes to wages vs. COL. Anyway, people have been refusing to use the lots and pay the $40 and the city can't figure out why. The people in charge claim it's a "complex issue". It's not that complex. You let people park and you allow them to hike. Charge them $5 if you want. If you don't let people into the tourist district of Manitou Springs, they won't patronize the businesses. There's a reason why I only go to Manitou once or twice a year (P.S. They don't even have any good restaurants..just a bunch of jewelry shops). They also say this system of paying $40 for parking "appears to have backfired". That should legitimately be Colorado's state motto: it appears to have backfired. They don't have good ideas for things or systems for making things work. This applies to highways, school systems, etc. They've been a state for a very long time compared to the rest of the west and they still don't understand how it works. C. As a side complaint, Manitou was the first part of Colorado Springs (they are their own borough) to legalize recreational sales of marijuana. Their school district and roads have benefited from that tax money while the rest of the city just gets to watch. Why don't they use this to maintain the trails? A. Last week, they continued to call me twice a day, every day. I answered while the kids were at recess one day and said that I would put a 4th grader on the phone the next time they called. I also said that I would never, ever, ever recommend them (despite their reliableness as a TV service) because they were "making it impossible for this military family to cancel". The guy (Nathan) said he'd put me on the do-not-call list and then they did stop calling. Nathan also insisted that my box to pack up my receiver was on the way and it was mailed on 1/10, even though I have an email from 1/3 saying it was shipped. I have an identical email from 1/10 saying the same thing. And, even though I canceled on 12/31, Nathan said my service was not recorded as disconnected until 1/8, which is funny because I paid the final pro-rated bill of $28 before 1/8. Nathan said they would ship me another box. If you go to "track my shipment" on the shipping confirmation emails for these boxes, it says the tracking number is invalid. B. I still don't have a box. I called on Friday morning and the lady (who seemed much more credible than the account manager buffoons I'd been dealing with, so I'll give her that) said "Oh, we don't ship boxes anymore. You should've gotten a letter with return instructions." I did get a letter with return instructions. The instructions exactly contradicted everything I'd been told on the phone for the last three weeks. Apparently, I've been shipped two fake boxes that don't actually exist, but she (I don't know her name and I don't care) could not confirm nor deny the existence of shipped boxes, other than to say not to expect them. C. I also, upon checking these shipping confirmation emails, noticed that they stuck a "t" in the name of my street in my address and that "t" is not supposed to be there. So they've had my address wrong for 4 years. 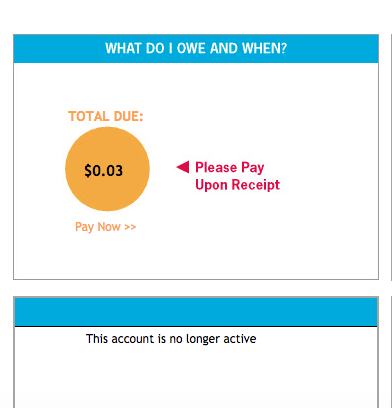 D. I online-chatted with a person the other day because I got a letter and an email saying I had a 3 cent balance I needed to pay but I can't log in to the website anymore because I don't have an account any longer. They sent me a letter saying they sent an email to DARHOWER@KRISTIN.COM asking me to pay this balance. Well. 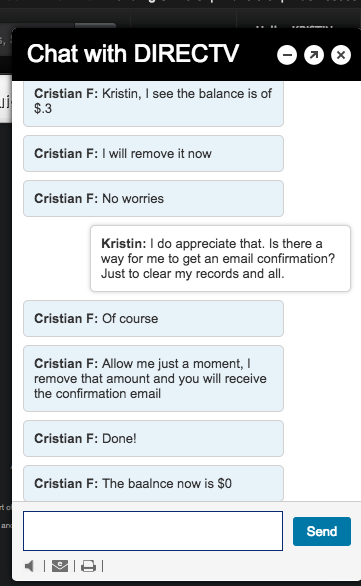 DARHOWER@KRISTIN.COM is the completely FAKE email address that an account manager made up for me to get me logged into the website weeks ago...so I could pay off my pro-rated bill after I canceled. It's FAKE. As in, it doesn't actually exist. It was created as a log-in, not as an actual email address, but NOW DirecTV has it ON RECORD AS MY EMAIL ADDRESS. This is how the conversation went with "Cristian" (male or female, I know not). I do know that I never, ever got an email confirmation. It was probably sent to DARHOWER@KRISTIN.COM. I sent this person my real email address after that last line of text you see up there though. Also, $.3 means 30 cents, not 3 cents. That was definitely incorrect on DirecTV's end of the chat. E. I took the receiver and remotes and whatever to UPS on Saturday and this is the confirmation and tracking information. Just to put it all out there. III. Mondays are hard and my weekends aren't often super eventful. We could avoid a lot of awkward conversations. Does anyone else have a headache now? If you have DirecTV, I promise you don't need it. Just start the cancellation process now. That cancellation malarkey gives me rage. What on earth are they playing at? It amazes me that it's that hard to get out of something, especially not something that's an actual utility or similar. I've been going back and forth with Barclaycard since last January about a benefit I was owed and never received - complicated by the fact I moved abroad partway through the dispute. So you can only imagine how well that went. I'm on for the non-PC list! I have a fairly controversial rant sat in my drafts which I am debating posting so I think I'm feeling particularly rebellious today. I feel the same bullhockey about Colorado being Colorado. Even though I'd joke about Skiing Every Day if I was in Denver. But, like Winter Sports, they are going about illegal drugs like a money machine, not a bank. Why why why do cable companies make it so ridiculously hard to cancel or set up service? Its all such a headache. 40 parking, that's beyond stupid, who actually pays that? Yeah, charge 5 & you'll make your money so much faster. Did you register your cars in Missouri? I hope not, because Missouri sounds WORSE than Colorado. Our Personal Property tax bill this year was $424 - we have a 2006 Toyota Prius and a 2013 Toyota Prius - HOW MUCH IS IT FOR PEOPLE WITH BIGGER AND MORE EXPENSIVE VEHICLES??? Every year the STATE sends your Vehicle Tag Renewal. Which costs about $40 per vehicle. On alternate years, you’ll need to get your vehicle inspected. California was cheaper and easier on vehicle fees than Missouri - Kansas was a nice, rational and reasonable state to live in. Why did we move across the river again?? *County, we have to go to the county for Personal Property not the country. Ugh. I agree with the Missouri comments and will add that if you move, and change your address on everything with the state, that does not include the DMV and your plates will expire bc they won't send you that stupid little card. Then when you inquire they won't know how to handle it. Ugh!! Nevada is the same way when it comes to registration fees. However, they do have emissions testing. I just spent over $700 to register both of our cars there. That cancellation thing drives me crazy for you. Been there, done that, with DirectTV. Hadn't been paid since October when we first set it up. Oops! Maybe send out a bill?! A reminder? Something?! Then maybe make the website accessible for crying out loud. Also, Colorado is weird. It's too expensive and they think they're hotter/cooler than they are....too big for their own britches. $40 is insane. Also again, (I probably just made you cringe with my double also, I completely agree about "how was your weekend" .... can we just not?! We actually haven’t had that much trouble with DirecTV, but we are headed down the road to cancelling just because of how expensive it is. They have had our last name misspelled since the beginning and have not changed it even at our request.